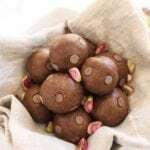 Nutty, chocolatey and super easy to tote along as a healthy snack, these no-bake Chocolate Chip Pistachio Protein Bites are gluten-free, rich in healthy fats, and a delight to sink your teeth into! Process the oats in a food processor until they resemble flour. Add the pistachios and do the same again. Transfer the mixture to a bowl and stir in the protein powder and cacao powder. Put the soaked dates into the processor and whirl until broken down into very small pieces. Add all remaining ingredients except the chocolate chips and puree until as smooth as possible. Gradually add the dry mixture to the wet ingredients, processing on high until fully incorporated. Add a little bit of water if needed and pause occasionally to scrape down the edges. Roll the dough into 12 small balls. Store leftovers in the fridge for up to 5 days, or freeze in a sealed container.